8.5% Rise in Number of Pakistani Students Studying in the U.S.
U.S. Embassy Cultural Attaché, Dr. Daniel S. Mattern, and EducationUSA Pakistan’s Advising Manager, Umair Khan, with students leaving for higher studies in the United States. 70 students who will study at American colleges and universities starting this fall attended a pre-departure orientation in Islamabad hosted by EducationUSA at the United States Educational Foundation in Pakistan (USEFP). Similar orientation sessions were held in Lahore and Karachi for a total of 188 students. The students will be enrolled in undergraduate and graduate programs at colleges and universities throughout the United States. The number of Pakistanis studying in the United States for the 2014-2015 academic year rose to 5,354, an increase of 8.5 percent over the previous year, according to the annual Open Doors Report. 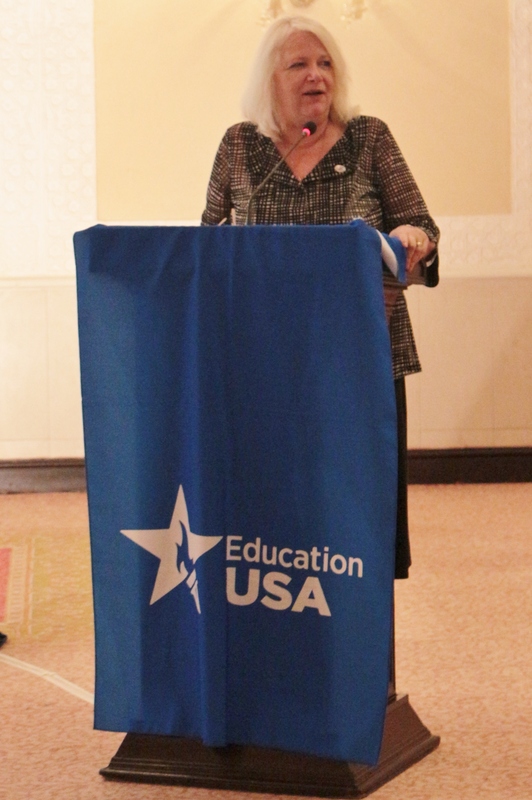 Rita Akhtar, USEFP Executive Director, spoke about U.S. university classrooms as a reflection of the country’s diversity. “USEFP aims to strengthen the relationship between U.S. universities and Pakistani students and we are pleased to be able to help talented students like you achieve admission to U.S. colleges and universities.” In addition to providing free educational advising services, USEFP manages a number of scholarship and professional development exchange programs, including the prestigious Fulbright Program. USEFp Executive Director, Ms. Rita Akhtar speaking at the pre-departure orientation. EducationUSA Pakistan’s Advising Manager, Umair Khan, congratulated the students and offered them tips. “Living in a foreign country is challenging and requires courage and a positive attitude. A majority of teachers in the American classrooms focus more on class participation, which may count towards final grades,” said Mr. Khan.